Welcome to my new blog series, Tool Tip Tuesday. 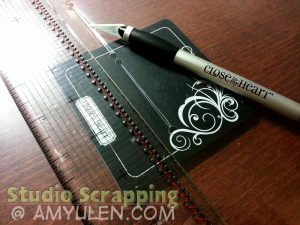 Each Tuesday, I’ll post how I use some of my favorite tools and supplies for memory keeping and papercrafting. Have tools in your stash and need some tips on how to use them? Leave a post on my blog or Facebook page, and I’ll see what I can do to help. 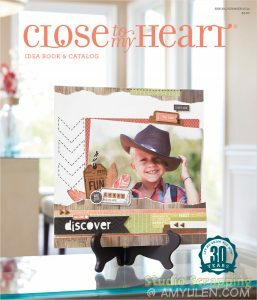 I like to keep my purchasing habits simple by getting a Close To My Heart Workshop on the Go each month. The kits come with a full paper pack, extra cardstock, two full packs of embellishments, a D-size stamp set, and an instructional brochure. All this for only $29.95! Most kits range in value from $40-42, so these kits are a huge savings. Plus, it takes me the whole month to use the kit—that’s always my goal, anyway—since it comes with so much product. The kits are only available for the life of the Idea Book or while supplies last, so I suggest getting your favorites early. Also, some kits such as Sparkle & Shine (shown here), are only available for a short time when we have special mini-catalogs. I stocked up on extra Sparkle & Shine paper packets, so I’ll be good for awhile…LOL! 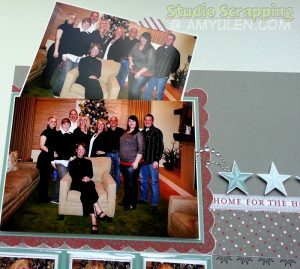 One of the easiest ways to make your layout interactive also helps you get more photos on the page! 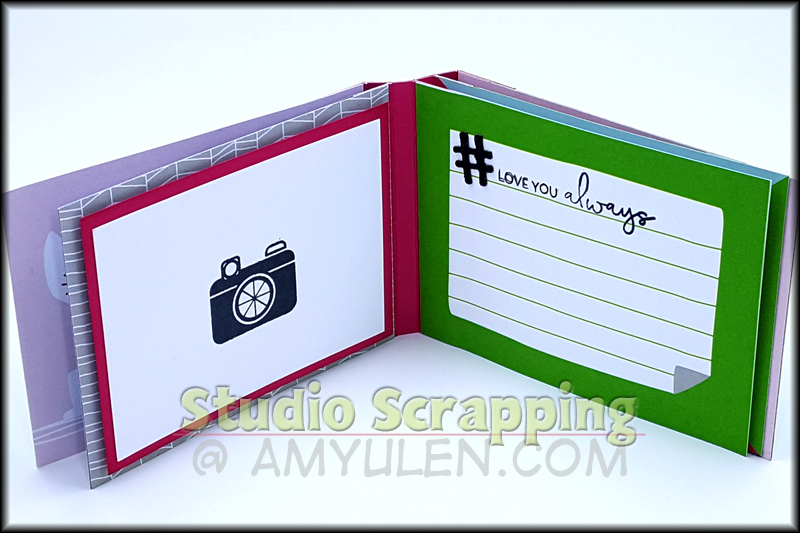 I use the Close To My Heart Flip Flaps to add more photos or additional journaling. 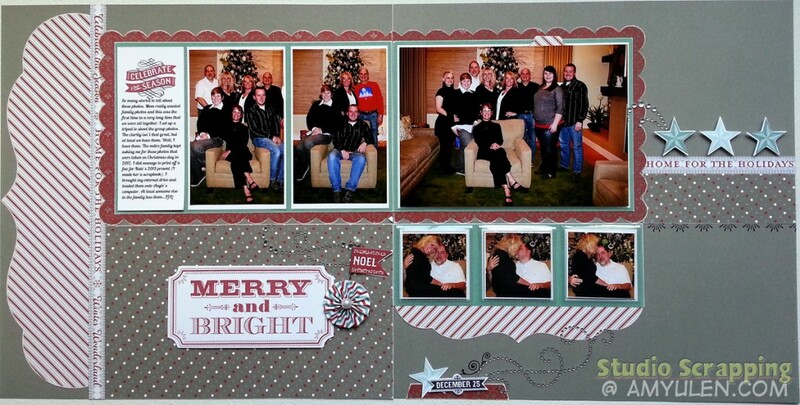 In this case, I printed a bunch of 2×2 photos to remember our Christmas 2012 photo shoot. One of the hidden photos is of me being a total goof ball and another is a bit blurry. 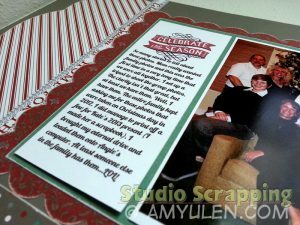 I still wanted to include it in the layout, because it tells the story of my mom, sister, and me marching around the house to Christmas music. 1) There is additional plastic on the adhesive side of the Flip Flap. Use your paper trimmer to trim that bit off. I also use my scissors to snip the corners to get rid of additional plastic and make the adhesive a little less obvious. I forgot to do that with this project which bums me out a little. 2) When adhering the Flip Flap directly to your page protector, make sure you know exactly where you plan to place it. The adhesive is strong, so you don’t want to move it around once it has been placed. Also, really rub the adhesive strip so you don’t see as much adhesive on the page protector. 3) My preferred method is adhering the Flip Flap directly to the project and sliding it through a slit in the page protector. This is where the tools come in handy! 1) Place your layout in the page protector. 2) Mark the start and end points of your Flip Flaps with a stylus or bone folder. 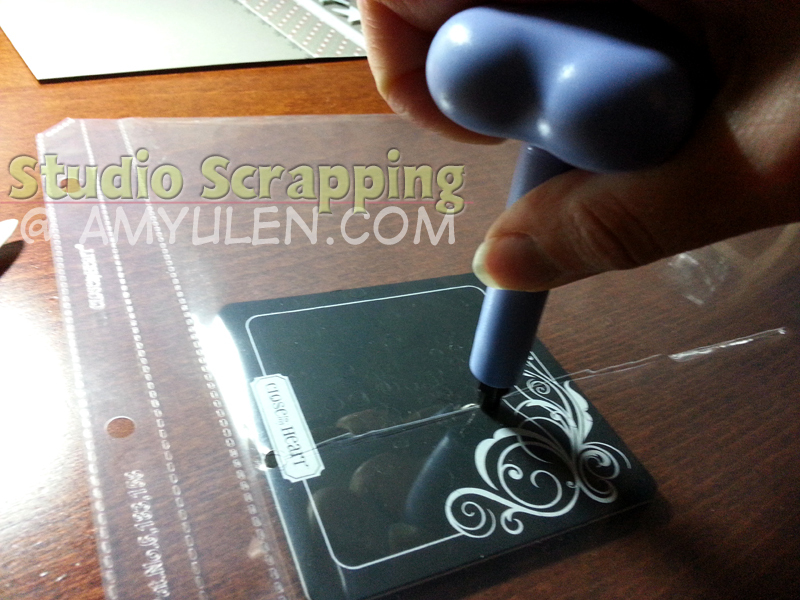 3) Remove the layout and insert a small, self-healing mat. 4) Use an eyelet tool to punch a small hole on the spots you marked. 5) Using your craft knife and ruler, cut a slit between the holes on top of the self-healing mat. You only want to do this on one side of the page protector, so make sure it is facing the right direction and that you have a mat inside the pocket. 6) Repeat as often as needed. I did this three times for my little Flip Flaps. 7) Place the layout back into the page protector and gently feed the Flip Flap through the slit. If using large Flip Flaps (e.g. 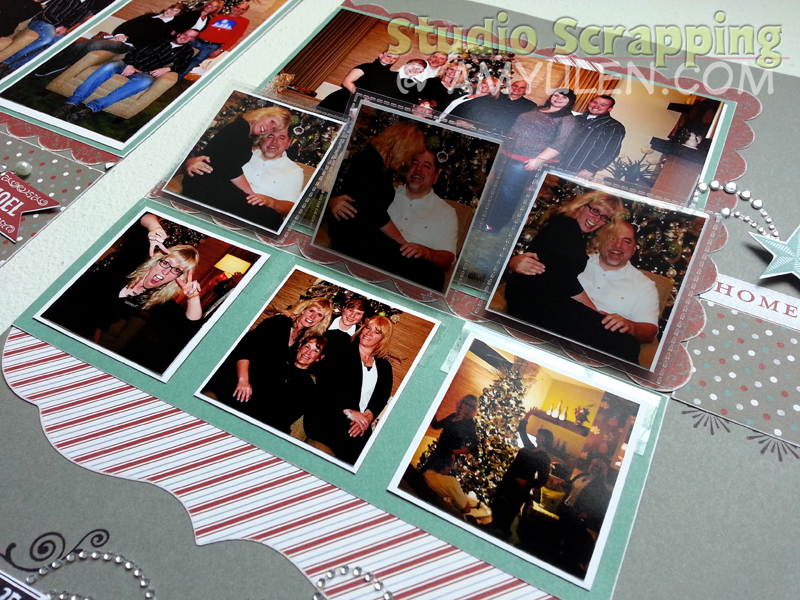 4×6 or 6×6), it is better to add the photos/journaling AFTER feeding the Flip Flap through the slit. The really large Flip Flaps (e.g. 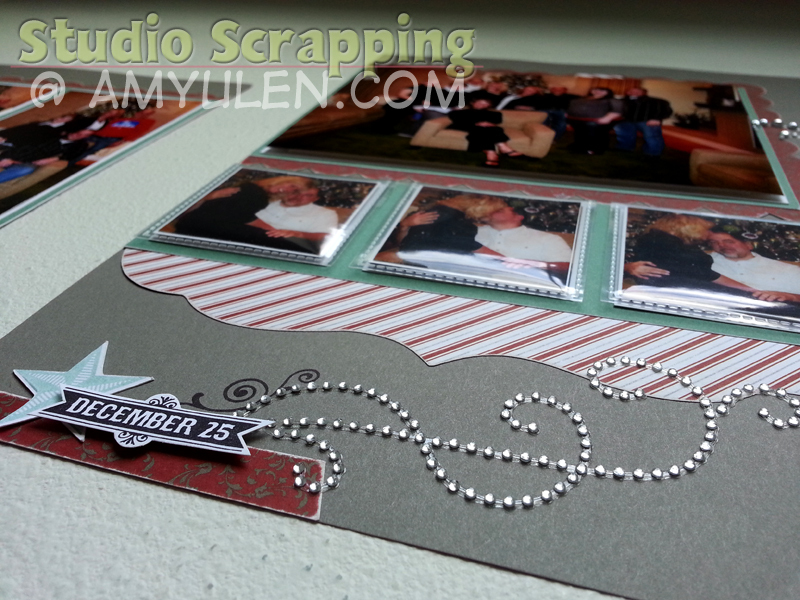 6×12, 4×12 & 8×12) work better on the outside of the page protector. One of my go-to techniques simply requires a bit of 3-D Foam Tape. Create a pocket by mounting a photo with foam tape on three sides only. 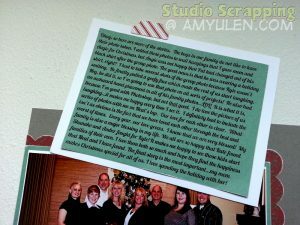 Put another photo or journaling on a piece of cardstock and slide it into the pocket. I cut a small pull tab with the Artiste Cricut cartridge (page 37) so my reader will know there is something hidden behind the photo. I decided not to put a slit in the page protector since it is so close to the top of the page. Thanks so much for visiting my blog. I hope will leave a comment letting me know what you would like to see on Tool Tip Tuesday. Also, let me know how you make your pages interactive. I would love to see your creation posted on my Facebook page.